The Dragon Tattoo is back and she finds herself entangled in the Spider’s Web. In the latest film based from Stieg Larsson’s Millennium series, Lisbeth Salander returns on a mission with a detour of facing the ghosts of her past. Bingers, here are our thoughts about Fede Alvarez’ take on the cyber-noir film. 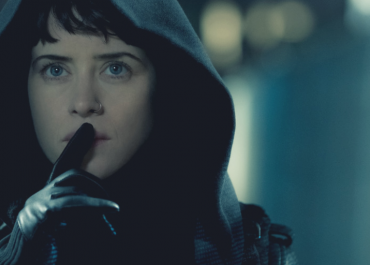 Claire Foy is the latest incarnation of Lisbeth Salander- a feminist hacker. In the pseudo-sequel to David Fincher’s The Girl with the Dragon Tattoo, Salander is tasked with retrieving a high-profile software that may potentially harm the entire world. Nations are trying to get their hands on it and on top of it is a terrorist organisation. While it may seem like any other mission, she soon finds herself entangled with the mess of her past life, particularly her childhood. In the first few minutes of the film, we were reminded of the Salander family and their father’s syndicate organisation. We were introduced to Lisbeth’s sister who, for the convenience of the plot, inherited the role from their father. The convenience of the plot elements was rather inconvenient as what could have been a strong narrative, ended up rehashing same-old plots. The excitement was barely there and I sat at the cinema waiting for my predictions to unfold. I am not saying that the film is bad, though. It just sorely missed the things that made Fincher’s movie a critical success- the surprise element, for one. Comparing Spider’s Web to Dragon Tattoo is inevitable, if I may add. If anything else, though, Alvarez’ take on the franchise had some good points. First off is the heart underneath the tattoo. Lisbeth Salander is this punk individual withdrawn from the world. She is her own hero. She does not rely on anybody else to achieve things. In Spider’s Web, Alvarez successfully peeled the layers of Lisbeth’s personality and reveal that underneath all those tough facade is a human capable of showing emotions. Part of the interesting added layer to the character is due to Claire Foy’s incredible acting chops. Her performance in First Man, where I first witnessed her talent, blew me away and she did the same in The Girl in The Spider’s Web. Her nuanced take on the character showed Salander’s vulnerabilities and subtle longing for human connection. Foy reminded me that Salander is this withdrawn individual yet underneath all her tough facade is a human with real emotions. Fede Alvarez’s take on the latest installment of the franchise may not have the merits of Fincher’s and that is okay. While the plots were predictable, the film made up for it with the action sequences and picturesque cinematography. His stylistic approach for the film reflected some James Bond vibes. I was prepared to hate the movie for its convenience, which was almost an excuse for lazy writing, but Claire Foy had this effect on me. She is simply brilliant that I wanted to be entangled in the Spider’s Web. Not a fan of this kind of movie but thank you for sharing this review to us. It will be a big help for the other movie goers out there. You did a good review and makes me curious what this story is all about. I will check this film for my weekend relaxation. Although this is not my type of genre, I must say that I liked the movie The Girl with Dragon Tattoo. Your review makes me curious about “The Girl in Spider Web”. I’ll consider watching this too.